Infinite Athletics is proud to present our high-intensity preseason preparation clinics to help high school athletes prepare to perform at their scholastic tryouts and outpace their competition. 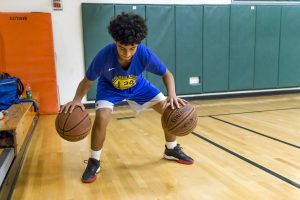 Each 90-minute session will consist of key skill development drills focusing on ball handling, shot mechanics, offensive attack moves, passing efficiency and basketball-specific conditioning. Led by former professional and NCAA Division I athletes with national strength and conditioning certifications, these clinics will enable players to prepare appropriately under the keen eye of IA coaches. Clinics take place on Wednesdays beginning October 17th with two sessions available from 5:00 to 6:30 pm and 6:30 to 8:00 pm at Professional Children’s School located at 132 W. 60th Street (near Columbus Circle). Players are able to register for single clinics or multiple weekly sessions. Registration fee is $40 per session and numbers are limited to ensure individualized attention. kevin@infiniteathletics.com for more info and to secure your spot. Or register today by simply clicking the button below!